A clear trend of larger firms (often utilities or IPPs) buying energy storage software and integrator startups. Who’s next? Wartsila, the massive marine and power plant specialist, just announced an acquisition of Greensmith for an undisclosed amount. This follows a recent trend of large firms acquiring small, growing energy storage firms. This is not an enormous surprise -- rumors had been swirling about a Greensmith acquisition for months. And, as Julian Spector reported in GTM Squared, Wartsila had just announced a combined engine and storage power plant product that was powered by Greensmith’s software. In this application, the batteries can act as spinning reserve, allowing the plant to respond quickly to grid needs without having to fire up the generator itself. Founded in 2008, Greensmith specializes in energy storage optimization and integration software, and employs over 40 people. Greensmith had won more than $27 million in investment from utility behemoths AEP and E.ON, as well as VC firms Cota Capital and TDF Ventures. E.ON and AEP are also customers. Greensmith projects range from a 20-megawatt system providing frequency regulation for grid operator PJM to 30-kilowatt behind-the-meter batteries in California, along with newer projects balancing intermittent solar power in Hawaii and Puerto Rico. Greensmith claims to be involved with 180 megawatts of energy storage, all running on its GEMS software platform. Greensmith has incorporated 14 different types of batteries, including multiple lithium-ion chemistries, as well as ViZn Energy’s zinc redox flow batteries, into its software suite. As of 2017, acquirer Wartsila has 63 gigawatts of installed power plant capacity in 176 countries, along with billions in revenue -- so customers will have no cause for balance-sheet worries. Doosan acquired 1Energy Systems. Wartsila has much in common with Doosan Heavy Industries, a large power equipment company. Italian utility Enel acquired a 100 percent stake in U.S.-based Demand Energy, a developer and operator of energy storage systems and software earlier this year. Enel's renewables division operates 36 gigawatts of clean energy around the world. French utility Engie bought an 80 percent stake in California-based C&I storage specialist Green Charge Networks in May of last year. Green Charge has previously raised $56 million from K Road DG in 2014, and an undisclosed amount from angel investors. In September of last year, a subsidiary of French mega-utility EDF acquired Groom Energy Solutions, an energy services company. 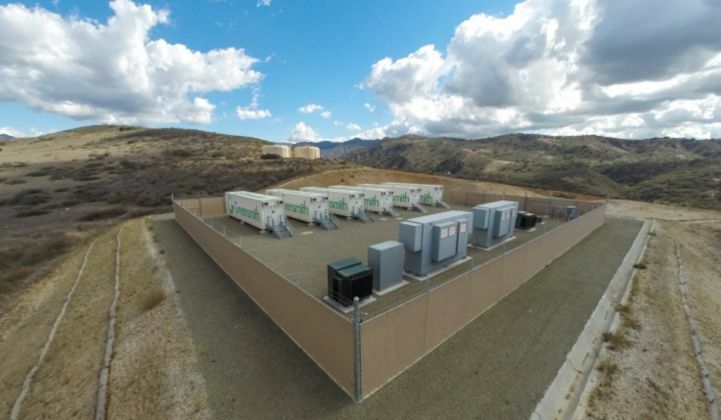 Greensmith was involved in the 20-megawatt, 80-megawatt-hour lithium-ion energy storage project at the AltaGas Pomona natural gas co-generation plant. Intended to mitigate the closure of the Aliso Canyon natural gas storage site in Southern California, the project was completed in just under five months. Greensmith provided the hardware and software for the plant and earned itself a GTM Grid Edge Award for its effort. Greensmith's CEO John Jung told GTM that the difference between solar or wind and energy storage is that "you can't unleash its potential unless you have the software right. And we have the best software in the business." Mallory Sass, Greensmith’s director of marketing, told GTM in an earlier interview: “The software is not just a simple control of charge and discharge -- it’s much more robust than that; it’s about being the conductor to the entire orchestra."